Flowers are the highlights of many gardens when they are present, but foliage plants (plants grown primarily for their leaves) boast reliability that is not to be scoffed at. Blooms come and go. But if you grow specimens with long-lasting leaves, there will always be something in your garden to delight you. Sure, you can coax a longer blooming period out of many flowers by deadheading them, but that means extra work on your part. And while that extra work is worthwhile, the subtler display put on by foliage plants requires no extra effort. A mix of plants with great foliage and great flowers is best. Select plants of varying heights to achieve a mix that will be even more diverse. Pachysandra terminalis spreads to fill in an area via underground runners. Reaching a height of about 6 inches, Pachysandra bears insignificant white flowers in spring. It prefers shade, so it's a great choice for those problems areas you have that don't receive much sunlight. It is sometimes called "Japanese spurge," but don't confuse it with wood spurge (Euphorbia amygdaloides), which is also essentially a foliage plant (although it does flower). Liriope spicata grows a bit taller than Pachysandra, reaching about 1 foot in height at maturity. And whereas Pachysandra exhibits fleshy, oblong leaves, Liriope resembles a grass. Liriope puts out a nice spiky flower, but its main selling point is its leaves. Perhaps its greatest value lies in its versatility: It is amenable to a sunny location or to partial shade. Foamy bells (Heucherella) and the related coral bells (Heuchera) are showier picks than either Pachysandra or Liriope. Plant breeders have produced a number of cultivars that bear leaves with jaw-dropping beauty. For example, Solar Power foamy bells displays fantastic golden leaves. An outstanding plant partner for Solar Power if you enjoy color contrasts is black mondo grass. Artemisia is another plant with colorful leaves. But in this case, the color in question is silver. In fact, the cultivar name of the most popular landscape specimen in this genus is Silver Mound. Wall germander is a sub-shrub that stands about 1 foot tall, with a width of a little more than that. You can treat it as if it were a miniature boxwood: Plant a row of it to form a short, ornamental hedge in a small area. Some ground covers are pretty but invasive. But you can grow such plants in pots so as to contain them while still enjoying their marvelous foliage. An example is bishop's weed (Aegopodium podagraria), one type of which has variegated leaves. Now it's time to look at some larger options, including trees and shrubs. Look for types with flashy colors to inject added interest into your plantings. Some offer golden leaves, for example; others blue leaves, such as Blue Star juniper (Juniperus squamata Blue Star), blue spruce trees (Picea pungens Glauca), and Blue Rug juniper (Juniperus horizontalis Wiltonii). If you want gold with height and you want it fast, you could also grow a vine: namely, golden hops (Humulus). Tricolor sage plants (Salvia officinalis Tricolor) do put out violet-colored blooms, but they are grown more for their variegated leaves. The older foliage on this herb tends to be green in the middle, with an irregular white margin; the younger leaves are purplish. These foliage plants are also fragrant plants (although the aroma is an acquired taste). Although they do bloom, hostas (Hosta spp.) are such terrific foliage plants that we often remove the flowers so that they don't distract us from enjoying the leaves. 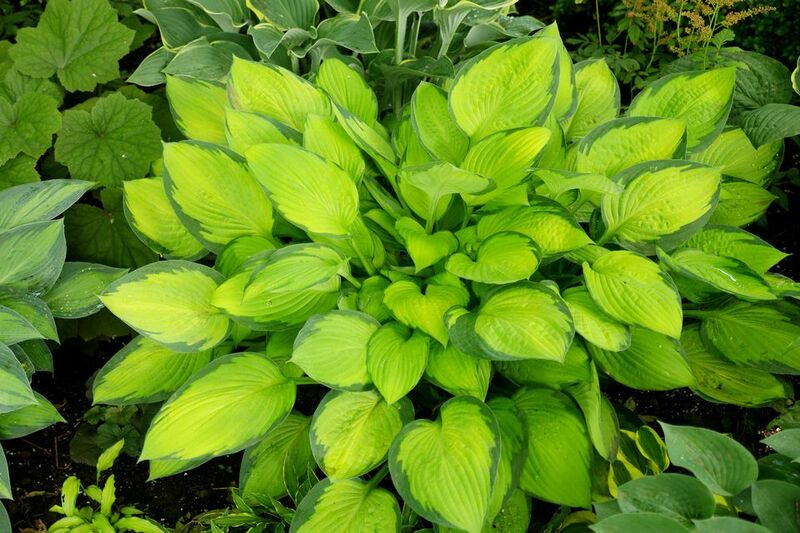 Classified as perennials, many hostas are nonetheless used in the landscape as if they were small shrubs (note, however, that hostas vary greatly in size, depending on the type). For instance, they are sometimes used as edging plants for a flower bed. Want green foliage with a tropical feel? Many Northern homeowners include elephant ear plants (Colocasia esculenta) in their landscape design, treating them as annual plants. They look especially nice near water features. Papyrus (Cyperus papyrus) is another tropical plant. Formerly used as a writing material, it now often functions, instead, as the centerpiece of a water garden. Invasive in some of the warmest states in the U.S., elsewhere, papyrus plants will die back after an autumn frost and are most easily treated as if they were annuals: let them spruce up your water feature during the summer, then replace them next year. Ferns are a classic choice for shade. You're not always restricted to shady areas with these ancient plants, though. Interrupted fern (Osmunda claytoniana) can be grown in a location that receives substantial sunshine during the course of the day, including afternoon sun. Do, however, keep its soil thoroughly moistened. Boxwood shrubs (Buxus) are broadleaf evergreens. Prized for their densely packed light-green leaves and rounded, compact growth habit, English boxwoods reach a height of 3 feet, at most. There are other boxwoods from which to choose, some of which grow taller. These elegant foliage plants have traditionally been used for formal garden hedges in areas with full sun to partial shade. Like boxwoods, yews (Taxus) are evergreen shrubs. But unlike boxwoods, yews are needle-bearing shrubs. English yews grow to about 4 feet tall, but they are "small shrubs" in terms of height, only. For their spread is much greater (12 to 15 feet), so they are hardly compact plants. There are other yews from which to choose, some of which grow taller. Yew shrubs are often used as hedges or foundation plants, especially in shaded areas (where many other shrubs wouldn't perform well).